This story was updated at 11:20 p.m. EST. Strong radiation from one of the most intense solar storms in the past five years has temporarily "blinded" a European spacecraft in orbit around Venus, and mission controllers are now racing to fix the problem. The European Space Agency's Venus Express probe, which is located much closer to the sun than Earth, experienced high doses of radiation from the recent solar storm, and on Tuesday (March 6) at 8:40 p.m. EST (0140 GMT March 7), spacecraft operators reported that Venus Express' onboard startracker cameras had become blinded. After being bombarded by solar radiation Tuesday, the cameras were unable to pick up any stars, said Octavio Camino, the Venus Express spacecraft operation manager at ESA's European Space Operations Center in Darmstadt, Germany. The startracker cameras take pictures of the sky and use internal databases to recognize the stars. The Venus Express probe uses this information to measure its position and orientation in space. "This information is calibrated with another tool, called gyroscopes, that tell the spacecraft what it's pointing at and what its angular rotation is," said Paolo Ferri, head of ESA's solar and planetary mission operations. "So the spacecraft uses the gyroscope information plus the calibrated information from startrackers to realize its current attitude." These cameras are crucial on all spacecraft, but are particularly important for interplanetary probes, since they have to continuously point their solar arrays at the sun and their antennas at the ground, Ferri told SPACE.com. Spacecraft operators have full control of Venus Express but are relying on just the onboard gyroscopes and manual corrections as they attempt to regain the startracker cameras. "For a human being, the startrackers are the eyes and the gyroscopes are the ears," Ferri said. "When you close your eyes, you can go on for a while with your ears if you're walking, but sooner or later you have to open your eyes and see where you are because the ears are not accurate enough." A massive X-class solar flare spewed from the sun on March 6, 2012. NASA's Solar Dynamics Observatory observed the eruption, which looks like a sparkling diamond in this picture. The sun has been active all week, but a strong solar storm erupted after the sun fired off two huge solar flares Tuesday. These flares unleashed a wave of solar plasma and energetic particles, called a coronal mass ejection, into space. Space weather scientists predicted that as these particles travel through space and bombard Earth's magnetic field, satellites and power grids on the ground could experience some disruptions. 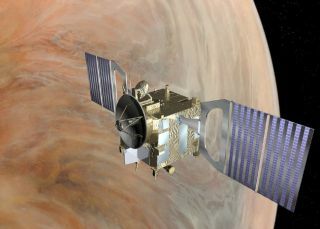 Venus Express' blindness is not expected to be permanent, and as the sun's activity has waxed and waned, the spacecraft has experienced similar glitches in the past. Still, the cameras have been out of commission for nearly 40 hours now, which is an unusually long time, Ferri said. "On this spacecraft, we've had between five and 10 cases where solar activity caused a drop of the startrackers," he explained. "In a case like this one, where it lasts so long, it's quite unusual. We had one time in the past where this lasted 32 hours, but this is quite a long duration, so it's sort of an exceptional case for us." ESA officials anticipate that this issue could last several days, particularly because the sun shows no signs of quieting down. "We have several days of margin if we need it, but of course we're concerned," Ferri said. "We don't like to be in this type of situation. Normally these spacecraft are very autonomous, but this forces us to do a lot of manual operations that we normally don't do." Eventually, the spacecraft is expected to return to normal operations, but ESA officials will continue to closely monitor the situation and maintain control of the probe. In the meantime, mission controllers have suspended many functions aboard Venus Express until things return to normal. "We're not assuming that this type of problem is permanent," Ferri said. "The sun normally goes through increases and decreases like this, and we need just a short period of quiet for us to recover to normal and for the startracker to reacquire the stars by itself. It's a lot of manual babysitting now, but we don't expect this to last forever."